Straight from a production room somewhere in San Francisco, comes Bace135, producer, arranger and mixer of this double EP, lingering between hip-hop, electronic and even movie theme music. The arrangements are great and bring to live some colourful palettes, sometimes bright, sometimes dark, containing mellow strings and groovy, variable bass-lines. Where it sounded too home-made, too clean, too PC-alike, in the beginning, after listening to this a while, makes you aware of the fact that Bace135 takes it one step further than most of the bedroom producers. 'Funky Engine' for instance; a lovely, melancholic piece that would do well on a movie soundtrack, holds nicely laced strings that betray Baceâ€™s musical insight. 'Olay' is made of some organs and seems to hold influences of DJ Shadowâ€™s legendary 'Endtroducing' album. 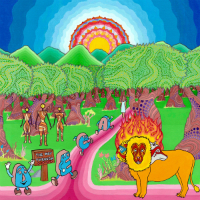 Furthermore, 'LuvUndrABridge' is a very imaginative track and makes this first EP real enjoyable. On 'Man Vs Machine', Baceâ€™s lyrics meet his typical production of electro-hop. Heâ€™s clearly not the best rapper on the block, but does his thing and doesnâ€™t really care, but dares to go absurd as he explains in 'Chim Chim Charoo'. Songs like 'One Man' and 'Hard Runnin' however, tip off some serious issues such as faith, persistence and holdin on to your ideals. 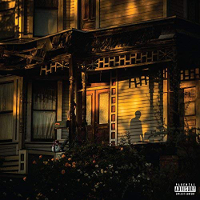 On 'Let Your Know (Rest For The Weary)', Bace comes pretty raw on a lyrical tip, with a kind of nonchalance that can be found in the rappin style of the Hieroglyphics or Living Legends. 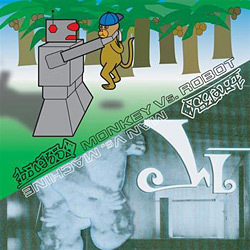 This project is not bad, the man knows how to make songs, how to hide his inabilities, he knows how to put together an album and completed two pretty cohesive EPâ€™s, of which the instrumental one, 'Monkey Vs Robot' is our favourite.